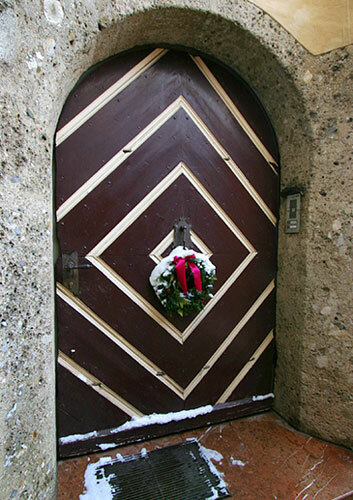 A door of a medieval burgher house in Salzburg, decorated for Christmas. Obviously, not all buildings in Salzburg are medieval - most locals reside in "normal" buildings at the outskirts of the city. However, the density of historic buildings in the city centre is exceptional and unique in Europe when it comes to uniformity and sheer number of this particular style. This door is in fact typical for Salzburg burgher houses: The step is made of marble from nearby Adnet, the walls of Salzburger Konglomerat, a popular stone once mined at various spots in the city of Salzburg itself. If you are interested in local geography, we recommend the "Haus der Natur", a museum of natural history with a focus on local things.